In 2015, I stopped over in Istanbul on my way to and fro Southeast Asia – see photos. I fell in love with the city and the charming people, but I was quite disappointed by the eating offerings as I pretty much stuck to the touristy areas that was limited to kebaps. When I returned back, I brought back a bunch of typical Turkish spices from the Spice Market sitting next to the Bosphorus River separating Europe from Asia. The dried herbs and peppers were bought with the intention of helping a cookbook author test some of her recipes from this region. In the process, I discovered that there was a delicious unchartered territory that was definitely worth exploring. 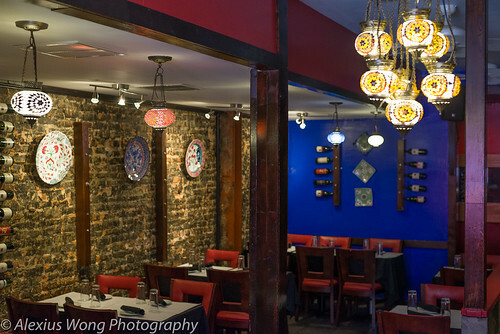 So, when I got wind of a Turkish restaurant located on a main street in Baltimore, I visited it a few times before writing this review. Walking into the Cazbar, you notice the rich-colored walls illuminated by the store-front window in the front and beautiful Turkish stained-glass lamps towards the back, reminding me of seeing them in a bazaar on my trip. The menu was easy to navigate and we honed on the set lunch specials that is available everyday including weekends for $14. After placing our order, we got our soups quite quickly. 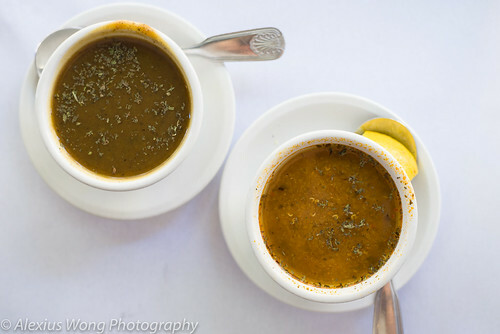 The first was Lentil Soup. It was made with red lentils and it was quite thin with the lentils pureed in it. It had a hint of dried mint that added some interest but it didn’t manage to wow us. The Pumpkin Soup was interesting as it was quite orangy in color but its sweetness was a bit too much for my dining companion. It exuded a dark spice that was later confirmed as cinnamon, but not the usual American type. Not a bad start, but no surprise that these were not impressive since they were starters for the set lunch. 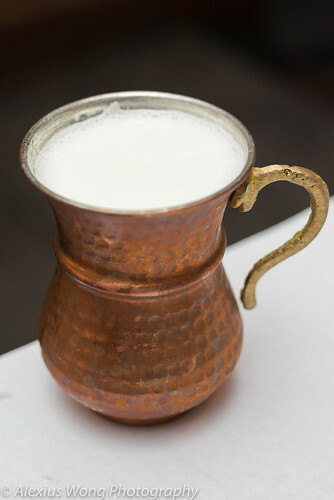 A glass of Ayra, yogurt drink, was quite refreshing as it was ice-cold, quite salty, and paradoxically light and creamy at the same time, and the brass container it came in exuded an Old World charm. The appetizers were next. There was quite a variety to choose from but we focused on the familiar and a recommendation. The Babaghanoush arrived in a beautiful metal container, and one dip into it revealed its smokey, vegetable sweet, and smooth silky nature that has been enriched by some tahini. The recommended Ezme was a surprising discovery. 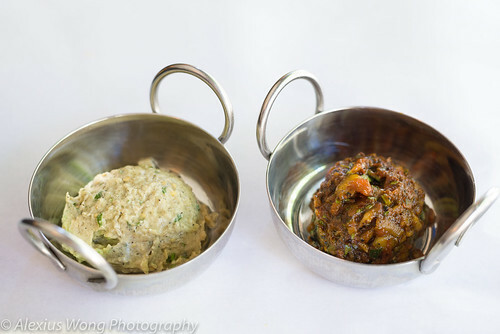 It is a vegetable dip made from finely chopped cucumber, tomato, onion and parsley, all brought together by some spicy pul biber pepper spice and sweetened with a recent discovery of mine, pomegranate molasses, that added a sweetness and tang to the delicious mix – my friends raved about it throughout the meal. 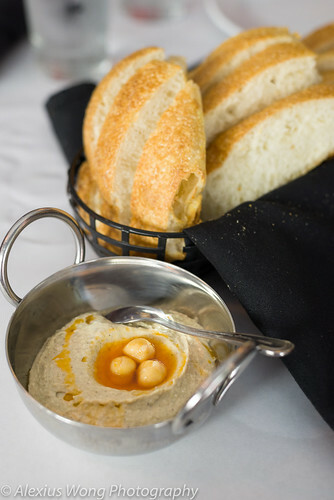 The Hummus on another visit proved to be extremely smooth, tasting rather rich from the tahini and perfumed by a hint of cumin that didn’t overwhelm the palette, an opener that pleased everyone at the table. Worth mentioning is the fantastic bread that was used to mop up all the above goodness with its freshly baked, crusty, and pillowy light inside qualities. I have heard of good Turkish bakers, and this was an epitome of such standard. A trip to a Turkish restaurant would be amiss if one didn’t taste the famous Döner Kebap. The version here is worth raving about: crispy bits with a softer inside (an indication of the proper rotisserie cooking), and a well-seasoned mix of lamb and beef with a faint taste of the gaminess that was appealing. The side salad that came with most dishes was well-dressed with a vinaigrette scented with dried mint leaves, served along with a buttery rice pilaf studded with toasted orzo-like pasta that was good enough to satisfy. 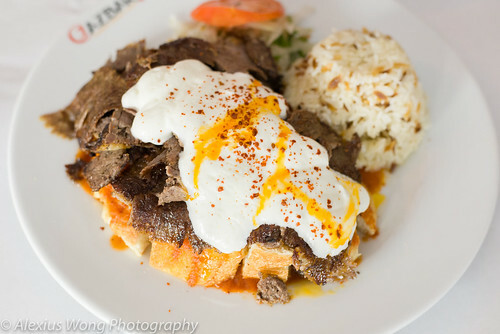 A supped up version of the above is Adana Iskander that is the same meat placed on pieces of light bread moistened by an amazingly light and fresh tomato sauce, and topped with a tangy yogurt sauce. The gestalt effect of each bite was extremely tasty and satisfying, making each forkful irresistible. 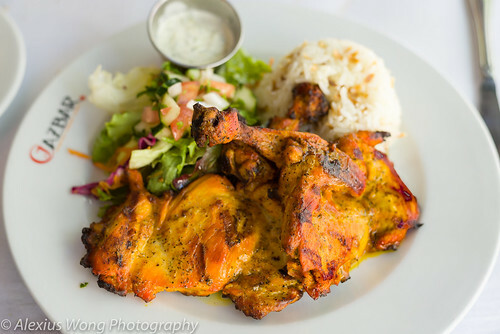 An order of Chicken Pirzola arrived looking like Chicken Tandoori with its bring orange color as a result of its marination in fresh oregano, Turkish paprika and issot red pepper spice. No one spice stood out but the overall effect was a tasty one paired with the smokiness from the grilling that kept the chicken still moist while having a slight char. 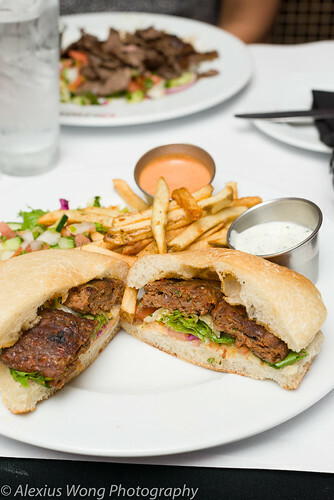 The side cucumber and fresh dill yogurt sauce was completely up my ally with its tangy, creamy and herbaceous quality. A lighter bite was Köfte Kebap Sandwich that composed of minced beef that has been seasoned with some spicy pepper, well-seasoned, but it was a bit tough. The french fries were a bit limpid but that was made up by the spicy French sauce-like dip that I couldn’t get enough of. The kitchen really knows how to operate the grill properly judging by these well-executed dishes. There were a couple of non-grilled meat dishes that we had to try. 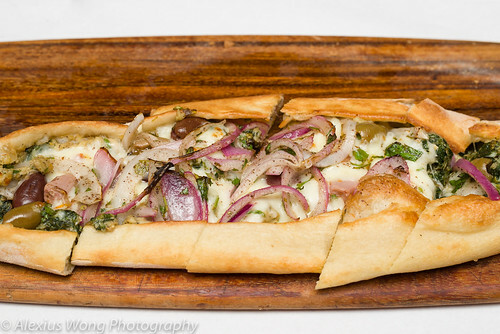 The first was Cyprus Pide. I had the pizza-like long bread in Istanbul, but unfortunately, it was rather greasy and unimpressive then. The version here was freshly made and far better than my first experience. The baked dough was soft and light with a yeasty scent, with fresh slices of red onion, pickled artichoke, brined olives, fresh spinach, all held down by some soft stringy cheese. The fresh slightly charred vegetal qualities were perfumed by some fresh oregano or marjoram that made each bite interesting and equally satisfying – an order of only this bread would have sufficed due to all its goodness. The other order was Lamb Moussaka. It arrived baked in a metal ware looking like regular Italian lasagna. 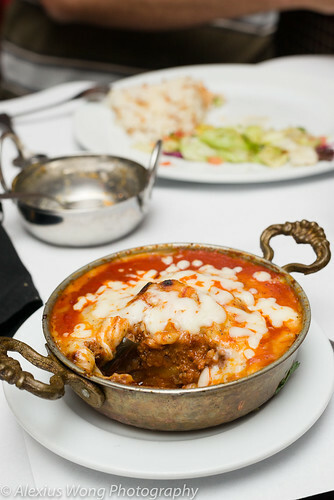 Breaking into it, you could taste the meat that was coarsely ground, slices of soft potato, a slightly spicy tomato sauce that tasted rather fresh, and soft melted cheese that was not overwhelming in flavor or amount. It was not the usual moussaka that the Greeks make, but my friend was happy with his selection and he disposed of it in no time. 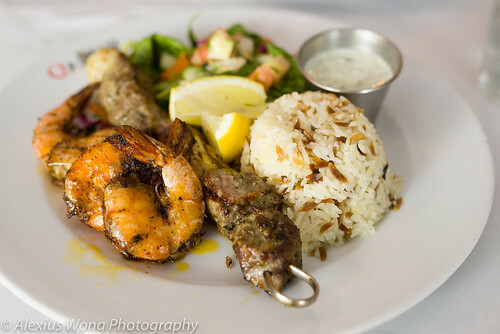 A couple of Combo Kebap dishes were savored on the last trip. My order was a combination of whole shrimp and chunks of lamb. The seafood was well-grilled and the shells managed to keep them still rather moist while tasting well-seasoned and sea sweet. 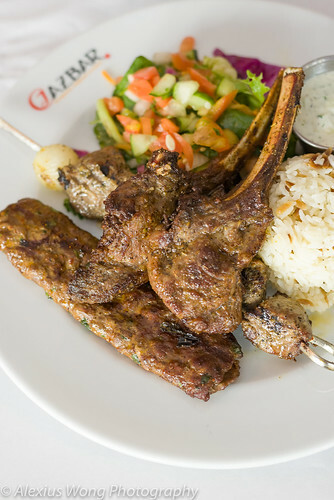 The lamb was a bit tough due to either the cut or its well-done state, which is common for cuisine from this part of the world. However, the meat was well-seasoned paired with a smoky char that added a tasty dimension to the chunks. My friends order was Lamb Three Ways: lamb chop, lamb kebap (like above dish), and ground lamb köfte. The latter was a bit spicy and had a hint of sourness in the ground meat, and the chop was still moist and had a slight scent of lamb gaminess that is to be expected, along with some good smoky char from the grill. My friend seemed completely sated from this lamb heaven indicated by his gnawing the chops down to their bare bones. 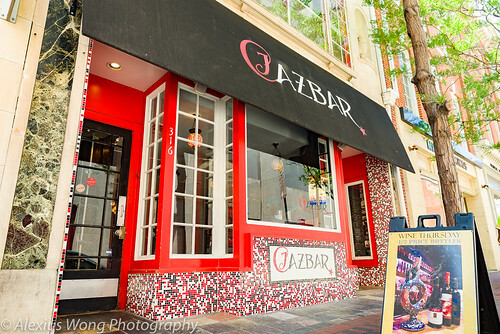 Cazbar is a great find, even though it is not in proper DC region. I really like this place for its location on the main street Baltimore where parking is free after 6 p.m. weekdays and all of Sunday. But what makes it worth visiting is its strong suits of the well-seasoned grilled seafood and meats (not too salty like many grill establishments), the amazing appetizers of babaghanoush, hummus, and that to-die-for Ezme, the thoughtful sides and sauces that balance each plate well, and the pide stuffed-bread and moussaka that are worth trying. 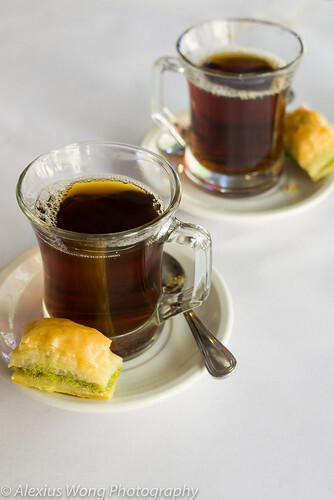 For $2 more, you can finish your meal with a glass of Turkish chai that was both slightly bitter and aromatic (reminding me of sitting by the Bosphorus sipping many cups of it), and the flaky nutty not-too-sweet Baklava that would give the diner a truly happy ending. To boot, the decor and service were both charming and extremely appealing, especially the congenial waiters we had on our visits. Cazbar is definitely worth many more visits with expertly cooked food like this, and it is high on my recommendation list.